Kim Hee Sun (김희선) and Freida Pinto attended Burberry Prorsum Fall/Winter 2013 fashion show held during the London Fashion Week at Hyde Park in London, England on February 18, 2013. Kim Hee Sun (김희선) wore a green floral embroidered trench coat from Burberry Prorsum Spring/Summer 2013 collection. Her look was completed with the same pair of wedges seen on the runway and a clutch from the collection. 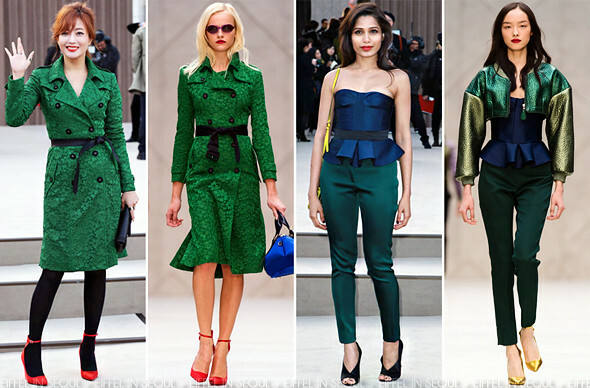 Freida Pinto opted for a navy peplum strapless blouse with green trousers from Spring/Summer 2013. A metallic yellow cross-bag and wedges from the same collection to complete her look. I almost did not recognize Kim Hee Sun (김희선) because of her hair color, she looked radiant. Freida Pinto looked flawless. However, I am not a fan of those wedges.